Rhea1 of Thorolund is the daughter of a prestigious family in the land of Thorolund. 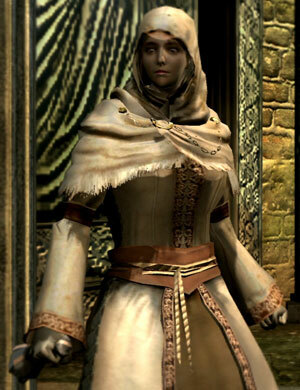 She is a priestess in the Way of White and is on a pilgrimage to find the Rite of Kindling in the Catacombs, along with her escorts Petrus, Vince, and Nico; the latter two were also her ex-classmates. She, along with Vince and Nico of Thorolund, appears next to Petrus after Capra Demon is defeated. If you talk to Petrus during their stay in Firelink Shrine, they disappear to the Tomb of the Giants. Encountering Pinwheel moves them to the Tomb, even if you have never talked to any of them. She lies in the pit which Patches kicks you down, assuming her and her company moved from Firelink Shrine. She requests you to "free" her friends. After killing them, talk to her, and she will give you the Replenishment Miracle. She then moves to the altar of Undead Parish church. While she prays in front of the altar, she dies after the death of any two following bosses: the Gaping Dragon, Bell Gargoyles, Priscilla, Sif, Nito, Quelaag, the Bed of Chaos, Iron Golem, Ornstein and Smough, The Four Kings, and Seath. Upon death, she drops seven Humanity and a Pendant. If you kill Petrus now he will drop an Ivory Talisman, proving that he murdered Rhea because that talisman is her unique drop. To save her, before killing any of the two aforementioned bosses, you either have to kill Petrus, or buy all of her miracles and her Divine Blessing. 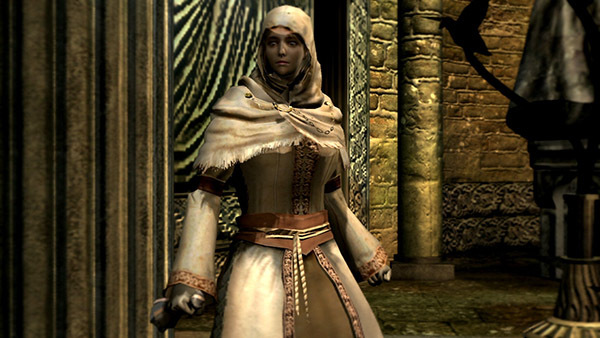 If you visit her before killing two of the bosses and buy all of her miracles without buying her Divine Blessing, she does not move on to the The Duke's Archives and stays in Undead Parish, regardless of how many bosses die. If you purchase all of her miracles before she dies, a Channeler kidnaps her, and she can be found Hollowed in a cell of the prison tower. Her cell door requires the Prison Extra key. Gifts Replenishment miracle after you kill the Hollowed Vince and Nico in Tomb of the Giants. Sells advanced Miracles after you rescued her from the Tomb. Allows you to join Way of White covenant. Heal 1,000 5 12 1 Heals a small amount of HP. Great Heal Excerpt 2,000 1 14 1 Heals a large amount of HP. Homeward 1,000 1 18 1 Return to last used bonfire, similar to the Homeward Bone item. Force 1,000 21 12 1 Inflicts no damage, but propels foes back and deflects arrows. Great Heal 10,000 3 24 1 Heals a huge amount of HP. Wrath of the Gods 10,000 3 28 1 Creates powerful shockwave. Seek Guidance 500 1 12 1 Shows more online hints. Magic Barrier 6,000 4 14 1 Covers body in defensive magic coating. If you kill Petrus prior to Rhea arriving at Firelink Shrine, she and her bodyguards will attack you on sight. If you kill Patches prior to rescuing Rhea in the Tomb of the Giants, the next place you will encounter her is in the Duke's Archives, as a hollow. Equipped with a unique version of the Maiden Set which contains no item names or descriptions and cannot be equipped on male characters. Killing Petrus after rescuing her may have a chance to make Rhea disappear from your playthrough. If you rescue Rhea before killing the Gargoyles, her interaction prompt may dissapear. Also a second version of her will appear where she was praying upon arrival, this one might try to kill you with her bare hands. Both bugs can be fixed by attacking (and not killing) Rhea at her parish location, and then have Oswald forgive your sins. You are Undead, as well? Then we've no time to fraternize. I have my mission, and you no doubt have yours. We must not let this curse overcome us. Did I not explain the urgency of our tasks? Who are you so uncouth as to lack such judgment? By the looks of you… I should think not. Are you a heretic, or just plain Hollow? It matters not, for you shall not escape! You will offend the Gods no longer! You're no Hollow, are you? Please be careful. There are two fierce Hollows not far from here. They were once brave knights… my former escorts. Who would let such strong spirits be Hollowed so? Heavens… Is there nothing… Nothing at all to be done? You banished those two Hollows, did you? It pains me to think of the trouble my failings have caused. I am certain that both Vince and Nico are grateful to you. Here, these belonged to them. You deserve them more than I. Perhaps this is my punishment? Clearly, I am no threat to you. But please, I ask just one thing. If I do go Hollow, then finish me off. Hello… I will never forget what you did. for it was not within my power to save Vince or Nico. In case you have not heard, I am Rhea of Thorolund. but I am inexperienced, and I only know the art of Miracles. If that could be of any help, speak to me again. Would a Miracle be of any help to you? I would be most pleased if that were so. May we discuss Miracles, then? Vince and Nico were fooled by a lout named Patches, and turned into Hollows. My prayers did them no good. It is my ignorance, my frailty that has sealed their fates. and thus made the decision to abandon me. I can hardly blame him now. I do not warm easily to unfamiliar faces. I have lost all those who were close to me. I was wondering when you might return. It is a great relief to see you. Now, let us speak of Miracles. I am most pleased to find you in good health. I am ready. Let us speak of Miracles. Oh! Please, forgive me. I was absorbed in prayer. The Miracles, I presume? I will be ready immediately. 1. Reah in the European release.